Fast forward to December 2013 and I had $220 in $5 bills tucked away safely at home. (I considered this really good considering I still rarely ever had cash). 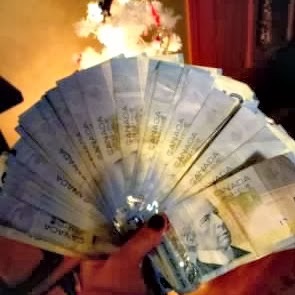 That month I finally bought myself a new laptop, with the help of my $5 bills (I briefly talked about it in this post). I had determined early in the year that I would want to buy something I considered 'special' with my $5 bills - I didn't want to save them all year just to end up paying bills, buying fuel, etc. Start saving those $5 bills people! What a great idea! I rarely ever have cash but I could probably still end up with a fair amount at the end of the year. So smart of you to write what you were saving for in in the first place! I love your $5 bill plan!! :) We neverrrr have cash either, so we just started a jar we put cash in any time we have it, whether it's a $20 (rare!) or a few quarters. It adds up!